Wow! What a day out on the northwest corner of Stellwagen bank. As soon as we got to the bank for our 10 am trip, we spotted blows all around us. 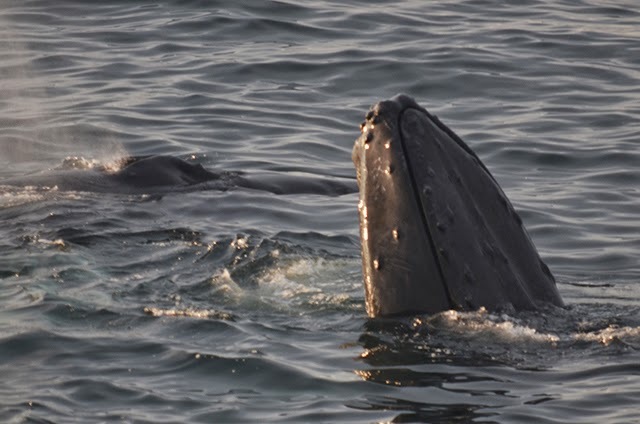 In total there were at least 16 humpbacks in the area! And not only did we have a lot of whales, they were very surface active. We saw breaches, pectoral slapping, tail throws, and even some spy-hopping. For the majority of the trip, all 16 whales were in one giant group! The IDs from our group included 5 mother-calf pairs; Nile and calf, Milkweed and calf, Tornado and calf, Canopy and calf, and Perseid and calf; as well as Draco, Cajun, Pepper, Jabiru, Bayou, and Aerospace. 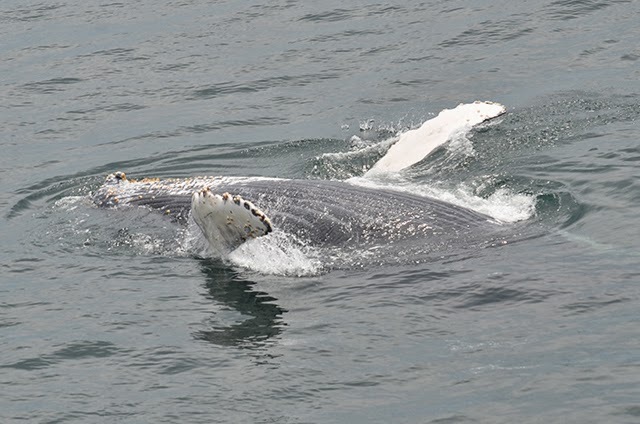 The adults in the group was taking short dives while the calves “played” at the surface. Canopy’s 2014 calf was particularly surface active. I imagine that the adults were doing some deep feeding. They were constantly changing direction of their travel. At one point, the entire group swam past the boat, so passengers on all sides of the boat had some amazing looks. On the 3pm trip, we couldn’t wait to get back to the northwest corner of the bank. Once we arrived, we spotted our large group again. During this trip the group had split into 3 smaller groups; Draco, Canopy and calf; Milkweed and calf; Tornado and calf, Nile and calf, Perseid and calf, Pepper, Bayou, Aerospace, and Cajun. Canopy's calf did not disappoint! We spent most of our time with Canopy, her calf, and Draco. Canopy’s calf continued with lots of surface activity, alternating between pectoral slapping, fluking, and breaching. Passengers screamed in excitement after seeing the calf breach. Rich, our research and education intern on board, noticed one of the terns in the area had a fish in its mouth. After zooming in on the photo we noticed it was a sand lance. It’s great to know that there were enough sand lance in the area to feed all those whales and even a few seabirds. Both trips from today were whale watches to remember for a lifetime, as many of the passengers agreed. I hope these whales stick around and continue their astonishing behaviors. This afternoon on the Asteria we headed up to the Northwest corner of Stellwagen Bank. There was lots of activity in the area! When we arrived we happened upon a large group of 7-10 humpbacks! Throughout the trip they started to split up. We were able to ID Canopy and calf who were traveling along consistently with Draco. Canopy’s calf was very exciting to watch. 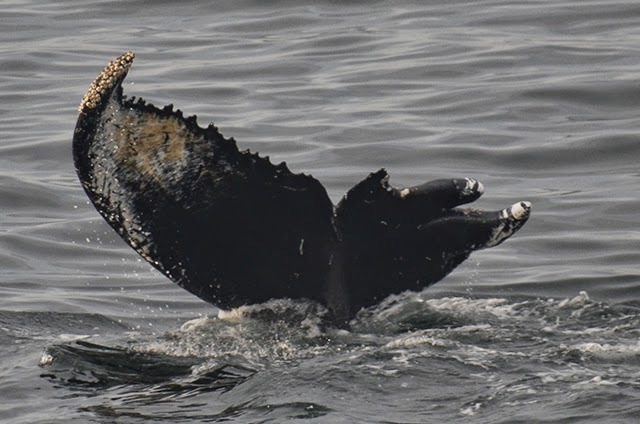 It spent a lot of time rolling about on the surface and slapping its pectoral flippers! This group in particular gave us many extremely close looks! 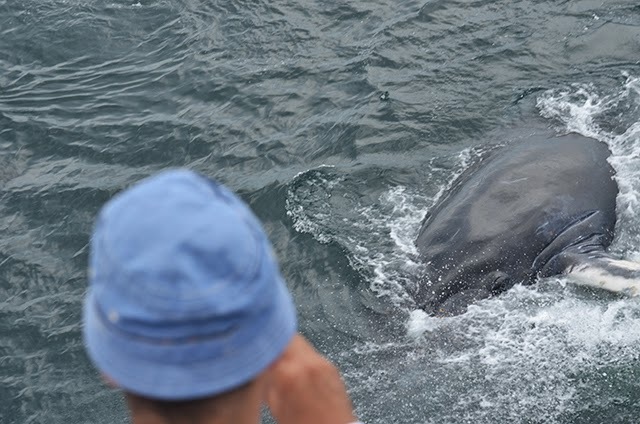 At one point some passengers even got to look the calf in the eye as it rolled over right next to us! The calf even treated us to a few breaches! Over the course of the trip we were able to ID 5 mom and calf pairs Including Tornado & calf, Nile & calf, Milkweed & calf, Perseid & calf, and Canopy & calf. Not to mention all the other whales in the area including, Bayou, Aerospace, Jabiru, Pepper and Draco! It was an outstanding trip and it was so amazing to see so many whales in such close proximity! This evening we travelled to the same area and had another great trip! A lot of the same individuals were in the area that we recognized from the morning trip which made it easier for us to ID everyone because they were all so recognizable. Passengers were treated to some awesome full breaches from Canopy’s calf as well as many close approaches by lots of the individuals in the area. Some of the individuals we saw included Perseid & calf, Draco, Canopy & calf, Aerospace, Bayou and Pepper! Nothing like whale watching in the sunset!